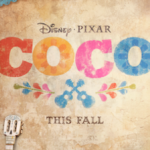 Pixar’s Coco is delighting audiences this holiday season with a touching story about family… and music and shoes. For young readers who would prefer to know the story before seeing the film, or for those who want to relive this story anytime, comes a hardcover junior novelization with some beautiful theming. 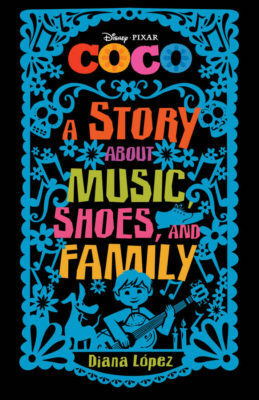 Coco: A Story About Music, Shoes, and Family can now be yours to read anytime your heart desires. Judging a book by its cover and overall design esthetic, I love the way the designers took the film’s prologue, told through papel picado (paper banners), and applied that not only to the cover, but the book’s pages as well. There’s a fun color coding system that allows readers to quickly see how much of the story takes place in our world and how much of it is set in the land of the dead. Pages that take place in our world have marigold yellow borders, while those that take place in the afterlife are navy blue. Each chapter begins with a papel picado which features Dante if the chapter takes place in the mortal world, Miguel in skeletal makeup if it’s on the other side. The first and last pages feature Miguel’s family tree, which changes by the end of the story and readers are encouraged to not read the one in the back of the book until they have finished the story, lest they want to ruin a major spoiler. 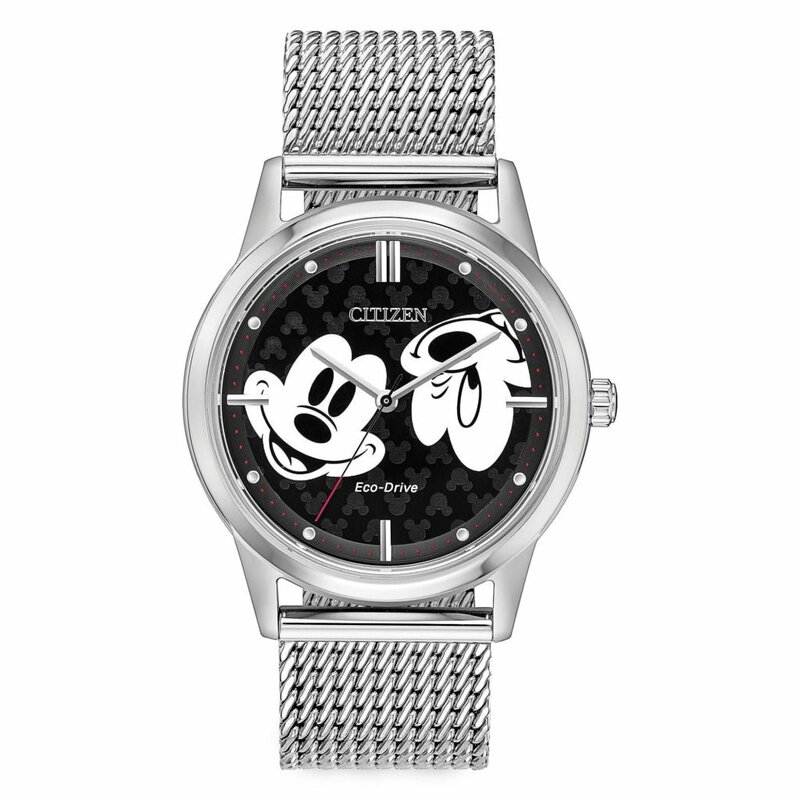 Author Diana Lopez has done a fantastic job adapting the film into written form, allowing the reader to get inside Miguel’s head and also pointing out some of the more subtle connecting tissue in the film that may have been lost on younger viewers. Since it’s told in the third person, readers gain some perspective on a few other characters as well. Like the dialogue in the film, the book also swaps English words for some commonly known Spanish ones. This is to the great benefit of any bilingual readers or any who have taken Spanish classes before, but might make it a bit challenging for anyone with no context for the language in written form. Musical moments are highlighted in the book and I recommend that readers have the soundtrack handy as well so they can hear the songs as they arrive at those moments in the story. Young Miguel knows that his destiny is to play music, but his family of shoemakers forbids it because of something that happened in his family’s history. 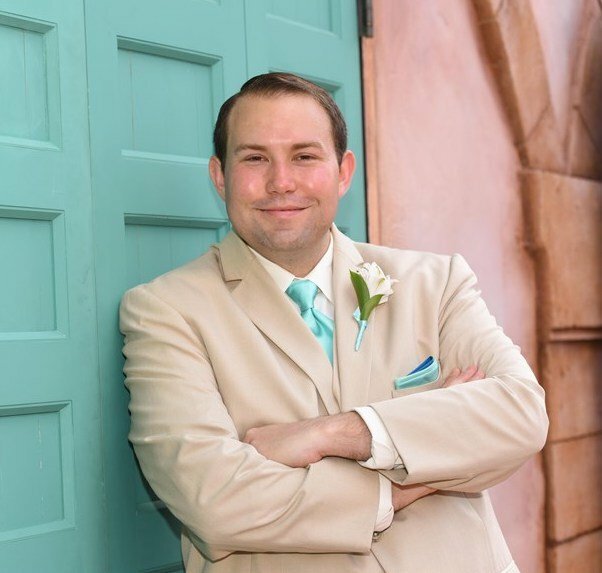 The only member of his family who really understands Miguel is his great grandmother Coco, who is losing her memory. 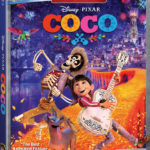 On the eve of Dia de lost Muertos, a fight with his family causes Miguel to run away from him and steal the guitar of his deceased idol, music legend Ernesto de la Cruz. After playing just one note on the stolen guitar, Miguel discovers that the living can no longer see him and the deceased skeletons roaming around town can! After finding his family in the land of the dead, he discovers that he must receive his family’s blessing before sunrise if he wishes to return to the land of the living, otherwise he will be trapped on the other side as a skeleton. 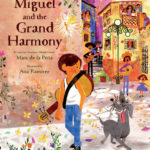 But when their conditions of return require Miguel to give up music for the rest of his life, he takes his chances and seeks out the very family member who caused the music ban in his family to begin with. 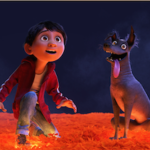 Aided by his dog pal Dante and a newfound friend Hector, Miguel embarks on a music-filled adventure through the land of the dead with many exciting twists and turns. As a film, Coco is thoroughly engaging. As a book, it’s the kind that kids won’t be able to put down. I recommend Coco: A Story About Music, Shoes, and Family to anyone who wants to linger in the story longer than the film allows.